As the holiday season approaches I’d like to encourage us all to find greater pursuits in life than material possessions. Instead of spending time shopping and acquiring more stuff, please consider these alternatives. Define ourselves by what we do, how we think, and who we love, rather than what we buy and own. Make it a priority to spend quality time with family and friends. Volunteer our time or resources to those in our family, neighborhood, and community that need help. One way that I’ve been giving back to the community is by delivering Meals On Wheels every Wednesday morning. It’s very rewarding. 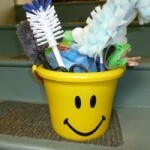 Once we’ve covered our basic needs, our happiness has very little to do with the amount of stuff we own. So, share the wealth with those who could use some help, especially our veterans. A worthwhile program in which I’ve participated is organized by Soldiers’ Angels. 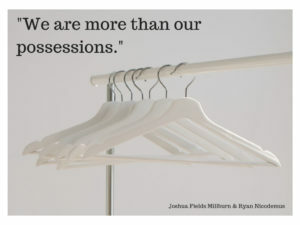 Value experiences over material possessions. Spend time cooking healthy meals as a family. Start a holiday tradition to hike or walk after the family feast. Play games together. Share photos and family stories with loved ones. Embrace the JOMO = joy of missing out. Limit technology overload by establishing email, text, and screen blackout times. Live in the moment and savor it. Be grateful and express your gratitude. Share what you’re thankful for in a gratitude journal. Purchase consumable products and intangible things instead of something that takes up space. Ideas can be found on my clutter-free gift idea list.